This post was written by Olivia Barker, KCK UK Director. "As I prepare to fly back out to Uganda this evening for another 2 months, I am reflecting on the year that has passed and looking forward to the next few months ahead. 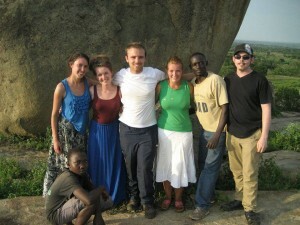 This time last year I was preparing to leave for Uganda,to spend an amazing 3 months there. We were so blessed to have 3 teams of over 17 international volunteers in total with us over the summer, undertaking numerous vital activities with the children and communities we work with. The volunteers ran kids clubs, held a party for our sponsored children, held training days for our Ugandan volunteers, ran counseling sessions for our vulnerable girls, ran a week-long children’s camp for over 1000 children and held business training sessions for our women’s initiatives, amongst many other things. We were also blessed to have a media and film intern, volunteers conducting research into our women’s craft products and water projects, and 2 volunteers who went on to climb Mount Kilimanjaro to raise money for our projects. Since that time a year ago a lot has happened. It truly has been an incredible year, for both myself personally and for Kids Club Kampala as a whole. The abandoned children’s home for our Ewafe project, which was only launched last year, is now almost complete. Our education project has expanded, as has our feeding programme, and we have several more children being sponsored to go to school. We have built a well, set up several new agricultural projects, and seen our women’s initiatives grow thanks to another team of international volunteers who joined us in Uganda in March. We have seen a huge increase in fundraising and are so grateful to the many people joining in supporting and volunteering with us over the last few months. This summer looks set to be another busy one, with several more international volunteers due to come out to Uganda over the next few weeks, including a team of student nurses who will be running a medical and health promotion programme for us. I am looking forward to going back to Uganda to visit all the children again, to catch up with old friends and to see all the progress and impact that our projects are making in the lives of thousands of children in Kampala. Thank you so much everyone who has and continues to support the work of Kids Club Kampala, it really means a lot that you are enabling us to make a huge difference to so many lives. If you would like any more information or would like to know how to get involved further with KCK, please do get in touch, I would love to hear from you.